A few weeks ago I had the pleasure of talking to John Doerfler, Sales and Event Manger for Kent County Tourism and the new person behind the Delaware Wine and Beer Festival. I wanted to talk to John to ask about any potential changes there may be coming for this year’s festival in light of some of the issues that plagued last year’s event. For those who didn’t go to last years or didn’t hear any of the rumblings, I’ll try to sum it up briefly. Oh Lordy, was it crowded. By the time we returned to the main festival after visiting the homebrew competition we found the place had turned into a collection of queued people waiting in one line or another. Lines at the vendor tents were easily 30-40 people deep, even deeper at the port-a-potties. The main path through the event was so crowded that it was hard to tell if you were standing in a vendor line, or standing in the line to get passed the vendor lines and some of those vendors would end up running out of beer early into the festival. We left early. Our friend (who had bought a VIP ticket) never got a beer from a vendor having only tasted the beers during the homebrew judging. I was disappointed because in the past, The Delaware Wine and Beer Festival had been my favorite yearly event, an awesome collection of everything in the beverage scene in the state of Delaware. Some time later I hoped that my disappointment was confined solely to me and my group, and I hoped everyone else who had attended found the festival enjoyable and fun. The Delaware Craft Beer and Wine Lovers Facebook page event for the festival had over 3200-people who had clicked that they were going to the event. People were posting comments about how much they looked forward to going and were eagerly tagging their friends to spread the word. Immediately after the event however, the tone on the thread changed. It seems that we were not the only ones disappointed by the event. And boy did they let us know. From the looks of things, the next festival would have its work cut out for it trying to address the issues that had been raised and so with that thought in mind, I contacted John to talk about that very thing. However, the phone call I went into thinking of strictly as an interview turned out to be more of a discussion. Plans for this year’s festival were still being ironed out, and John was very interested in hearing what criticisms myself and others had about last year’s event to see if they were in line with some of the feedback he had heard. As such I won’t write a detailed recap of our discussion, I will instead hit some of the highlights to explain the reasoning behind the announced changes. VENUE: As stated in Thursday’s release, the event is being moved away from the Delaware Agricultural Museum. Moving the festival to the Harrington Fairgrounds immediately relieves several of the problems from last year. The larger venue allows the festival to be more spread out and thus eliminate the congestion, plus make space for more toilets. VIP DIFFERENTIAL: Of all the big issues I thought last year’s event suffered from, I thought this was a pretty important one. When I stated that some folks didn’t see the value in the VIP ticket compared to the general admission ticket I had to admit that I agreed with them. If you haven’t seen the information yet, the festival is offering general admission tickets from now until July 8th, for only $25. After July 8th, advance admission will be $35, and day-of-event tickets will be $40. Your ticket will get you entrance into the festival and you can sample any beers, wines or spirits, as well as purchase a full pour (full glass of beer, wine or a cocktail). Still, will this guarantee that some breweries won’t still run out. No, because sometimes breweries can only give so much. I happen to know that part of the reason Argilla left early last year was because their annual Fall Festival was the following weekend and Steve only had so many kegs he could release to Delaware’s event. Likewise, Big Oyster had just started up their small production brewery and was also probably limited to the number of kegs they could contribute. That being said, John’s goal is to have as much beer (and wine, mead, spirits) available for festival goers throughout the entire event. 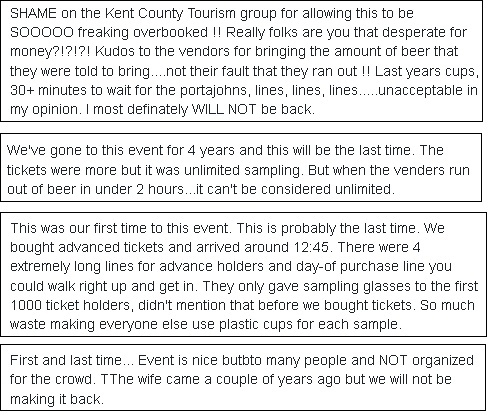 LONG LINES: Although John acknowledges that some waiting in line is a benefit to help control over consumption, he was quick to point out that he felt that waiting 25-30 minutes in line for a sample was unacceptable. John would like to see three to four smaller lines at each tent instead of one long one. “If we could set it up where the breweries have more taps and we have more volunteers to help them pour, then the line problem becomes more manageable”. And as far as people standing in line waiting to get into the festival? “We have access to the latest technology to get people into the festival as fast as possible”, John said. I was very encouraged about this year’s festival after my discussion with John. I found him eager to discuss how the festival might be improved and he took none of the issues from last year’s patrons lightly or offhandedly. In fact, on several occasions when I brought up an issue he would quickly agree that there should be a better alternative which lead me to believe that he had already given the matter some consideration. I think this can be best illustrated by a point towards the end of our discussion when I brought up the fact that many people were disappointed in the use of plastic cups. I didn’t even get to finish my statement. As always I’d like to thank both John Doerfler and Justine Zimney for taking some of their valuable time to talk to me. Saturday, October 15, 2016, 12 noon – 5 p.m. The festival includes live music, performers, games, and access to a select number of local eateries featuring gourmet foods and Delaware delicacies. 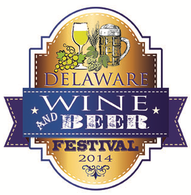 We will offer a merchandise store and a wine store with discounted prices on bottles or cases of Delaware-made wines. Please note: There are no refunds for this event, and it will be held rain or shine.